Even though I haven’t been posting about my knitting much lately (last time was June 8! ), I have been knitting, a little bit. Since my poll about the Sock Hop sock, I decided to rip down to the toe and start anew. I decided to go in plain stockinette this time. This sock is my traveling sock, so it doesn’t see much action. But I’ll get it done eventually. My at-home sock is Pomatomus sock #2. I only work on it while watching TV, and I haven’t been watching much TV lately so it’s going along slowly. I’m more than halfway through the foot already though so hopefully I’ll have it done sooner than later. Especially since I have some sock yarn lined up for my next pair! 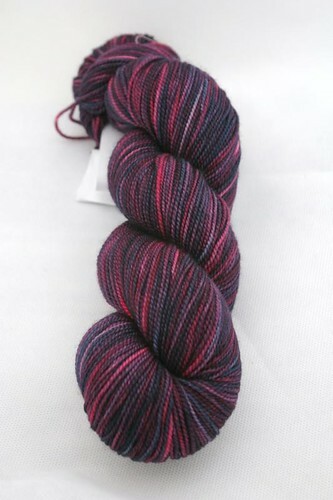 That right there, is one gorgeous skein of Madelinetosh Sock in Black Currant, from yarn4socks of course. I’m going to be doing a Knitspot pattern with it, but I just can’t decide which one. Any suggestions? This is what I call a salad. My kind of salad. With fresh picked CSA greens, radishes, tomatoes and avocado. Homemade dressing, bread and butter. Best kind of meal! 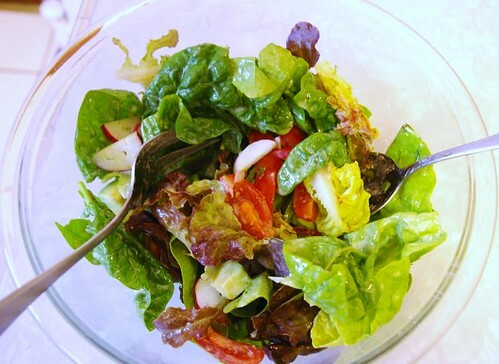 Click on the photo for more details and my salad dressing recipe. Wow. That salad is perfect. Peas. I tend to put them in stir fry. Or just stir fry them, or put them in the rice steamer with some Myers Lemon infused olive oil (and rice). The salad looks yummy! I always add pine nuts or sunflower seeds to mine too. mmmmm, that is one good looking salad! your sock hop socks look fantastic! Looks like it makes a great traveling sock. 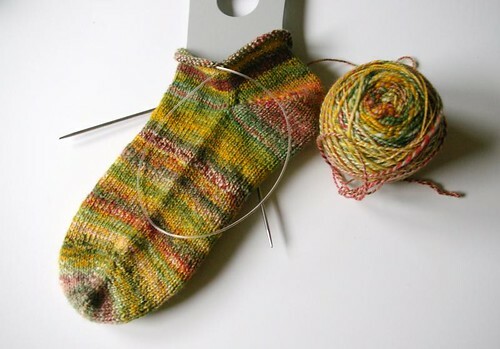 love your pomatomus socks, and your madelintosh is freaking beautiful! Love that colorway. Wow, both the Sock Hop and the Black Currant are gorgeous!! Okay, now I’m hungry. Great looking salad! I love your Pomatomus! I enjoyed this pattern. That Madelintosh colorway is gorgeous! Gorgeous socks, both the handspun and the blue ones. 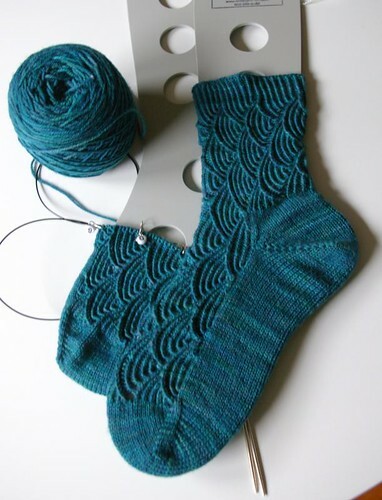 Love the yarn you have lined up for your next socks too.